The camcorder provides extremely high sensitivity due to the back-illuminated Exmor R CMOS sensor. With 8 million effective pixels, the 1/2.33″ sensor captures 4K images at 50p or 60p. The inbuilt high-performance G Lens offers maximum shooting flexibility, including a wide angle of 29.5mm (equivalent to 35mm) and 20x powerful optical zoom. 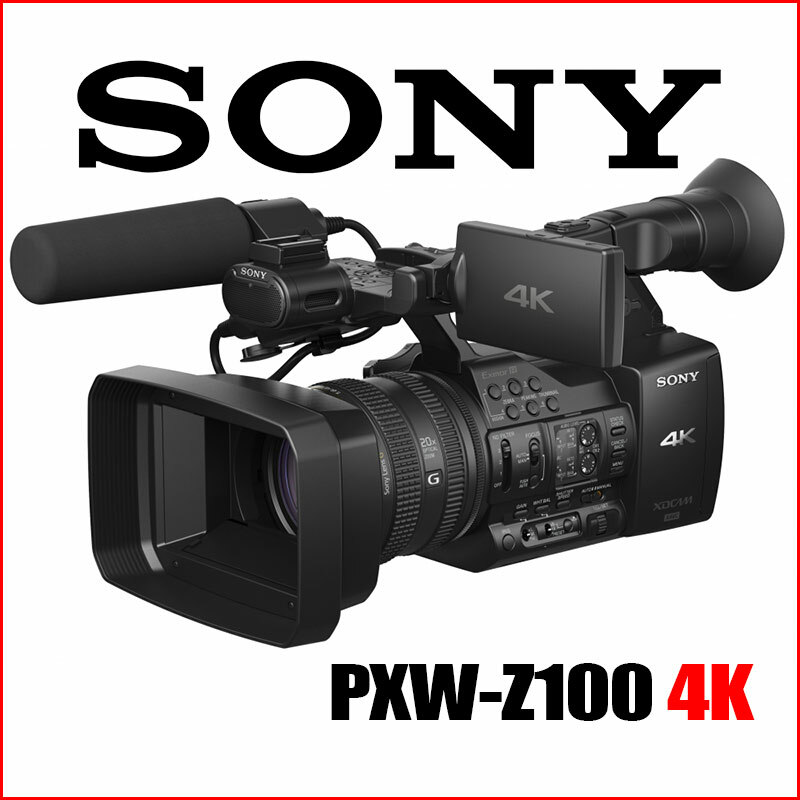 The PXW-Z100 uses Sony’s XAVC recording format first employed in the PMW-F55 CineAlta 4K camera. MPEG-4 AVC/H.264 compression is used for HD (1920×1080), QFHD (3840×2016) and 4K (4096×2160) content. Image sampling is 4:2:2 10-bit, with an intra-frame system that compresses each frame individually at a maximum bit rate of 500Mbps or 600Mbps during 4K 50p or 60p recording respectively and 223Mbps during HD 50p or 60p recording. The XAVC format is ideal for those looking to implement a high-quality, secure and worry-free workflow. A non-chargeable firmware update is planned for the middle of 2014 to support the Long GOP mode for extended 4K recording time and to add support for AVCHD recording. The XQD Memory Card is a new standard of solid state memory, which was recently defined by several industry leading companies. XQD uses the ultra-fast PCI Express interface and Sony’s unique camera processor to enable stable video recording at 500Mbps or 600Mbps. The PXW-Z100 features two XQD Memory Card slots. Multiple cards can be used in various ways, such as for relay recording. When the first card becomes full, recording continues on the second card without a break. * The use of new S Series XQD cards (QD-S32E or QD-S64E which supports 180MB/s transfer speed) is recommended. The HDMI interface on the PXW-Z100 can output 4K as a 50p/60p signal. When the PXW-Z100 is connected to a Sony 4K-compatible BRAVIA TV, the recorded 4K image can be displayed in 4K 50p/60p quality. A future firmware upgrade is planned to provide compatibility with the new HDMI 2.0 standard and enable 4K 50p/60p output to a wider range of devices. Other features include a 3G HD-SDI interface that supports output up to HD 60p. It also supports HD output during 4K recording. The PXW-Z100’s paint function enables multiple image parameters to be adjusted including gamma curve, black level, skin detail and colour. The range of settings is similar to those available in the PMW-F55. Together with other setting options, parameter settings can be recorded as a camera profile onto a memory card. The recorded camera profile can then be used to set the same parameters in another PXW-Z100 to enable the matching of quality and image tones when using a multi-camera setup. Focus, zoom, aperture settings and ‘record start/stop’ can be remote controlled using the browser function of a smartphone or tablet. Oh my. There goes my theory about not including 50Mbps. Although positioned as a prosumer camcorder, it appears to meet broadcast specs. At the price point of USD$4500, I think this unit will do well for Sony, especially since they’ve evolved the form factor to 4K. As a Z5U owner, and a PD170 before that, it would be quite simple to pick up this camcorder and start working with it. I look forward to seeing sample footage from the FDR-AX1. I think you have the specs mixed up a little. FDR-AX1 is 8bit 4:2:0 XAVCS LongGOP and will also record AVCHD to 28Mbps at 50/60P. 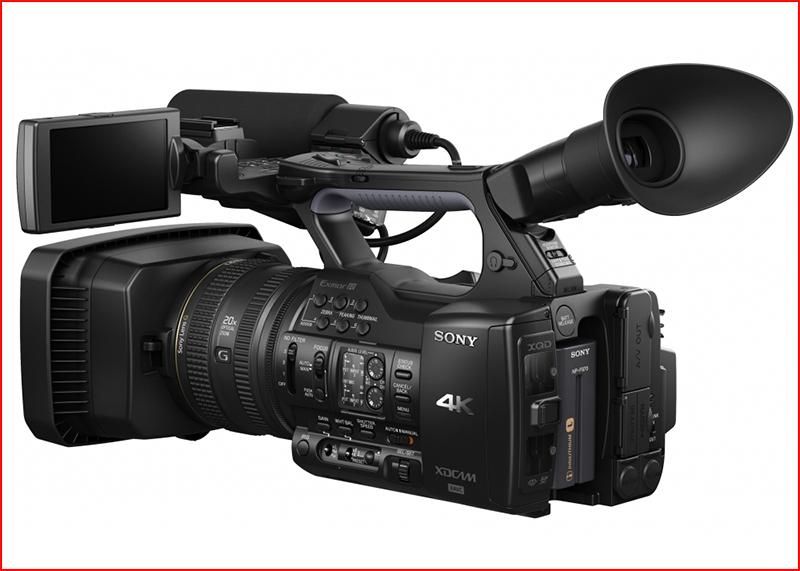 The PXW-Z100 is 10bit intra frame 4:2:2 XAVC just like the F5/F55. It will get a firmware update next year to include the XAVCS LongGOP spec of the FDR-AX1 but for now its the full XAVC codec at data rates 4 times that of the AX1. PXW-Z100 has SDI the FDR-AX1 does not. At least that is how I am reading all the available information. HDW : Thanks Ron, this is getting very confusing. Very interesting camcorder. Now looking how Canon, Pana and JVC will respond to this. The Z100 has an SD slot next to the XQD slots that is set to record AVCHD. That way, you can do jobs that require handing over rushes to client – who’s happy with AVCHD. There are also 4:2:0 LongGOP codecs for XAVC which will do the monster records we need. If all else fails, just record to Ninja2 on spinning disk – 11 hours, ready to edit and so on. why buying the Z100 if i have to record in HD to a Ninja2 in 1080i50. sony cameras are excellent and my cameras all is sony cameras is pmw-200, EX3,EX1OR, Z7 sony camera’s good quality but pmw-200 is ZOOM technical PROBLEM not solve this problem of service center my purches is 3-months. I have been using my Sony PXW-Z100 since late 2013 and it is an excellent digital 4K video camera recorder. But, despite the firmware update in February 2014, it is still not finished so that you can use all of the facilities provided, which I do find astonishing. This means that you cannot plug a USB 3.0 hard drive into the camera and transfer footage across to it while out shooting – this would be very useful since a 1TB drive costs just over a 10th of a 64GB XQD card. I don’t know whether it is the custom of the manufacturers of professional equipment to provide hardware on the equipment that can only be used in the future when the firmware is eventually updated? There is a promised update in the Summer of 2014 for some or all of these things to be corrected, I understand, but I cannot find out when that firmware will actually be issued. Enquiries to Sony get you tossed around from one department to another. I guess someone somewhere knows, but not the camera owners. Finally, the mxf files produced by the camera include 8 audio channels, channels 1 and 2 being left and right respectively (corrected after the first firmware issued as they were the wrong way round). It would be great if two other channels could be used for the XLR inputs, so that you could record 4 channels at a time, not just two, but I guess this is a missed opportunity which cannot be corrected now without modification to the hardware. In summary, Sony have sold an excellent camera which produces high quality film, but they have sold it before it was completely ready. Not being able to use the facilities that will eventually be provided (sometime never) is very frustrating for this particular owner. My sony pxw z100 camera have focus problen. i repaired 2 times. macanic said it’s data problem. while focus any object then pull back, focus is out. i think it’s lens problem. please suggest me and help me it’s solve.